As a goalkeeper, you’re the last line of your team’s defense. A solid defense will be at least twice as good with a competent goalkeeper backing it up. Your role in every game is two-fold. Primarily, you should keep the ball out of the net and the favorable scoreboard will indirectly reflect on the team’s morale. 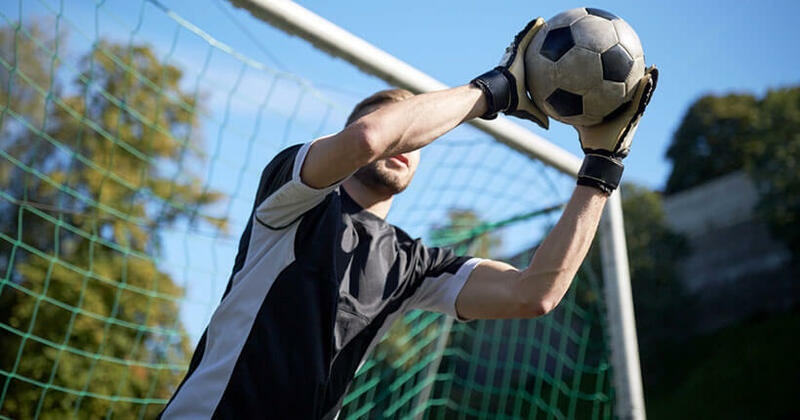 Ways to improve your goalkeeping skills are too many to number, so we’ll cover some of the most famous drills you’ll need to master and we’ll also give you some useful tips along the way. Stick around till the end of the blog post and start boosting your goalkeeping skills today. These are your fundamental skills to master if you want to properly support your team from the goal line. You can always upgrade your knowledge further by exploring some of the best soccer programs found online. Many goalies usually underestimate the importance of talking with their teammates. By communicating, you’ll make it easier for them to mark your opponents since they can pretty much do whatever they want without marking. Remember that your players can’t see the entire field, so it’s vital for you to communicate which opponents they should mark. Think of bad reflexes as jumping into water without learning how to swim. Contrary to popular belief, good reflexes are not a matter of talent and have to be “learned.” Peter Schmeichel, the former goalkeeper for Manchester United, combined handball goalkeeping with football goalkeeping for optimal results. Other training options include rotation drills, parrying and simple catch drills, and, of course, wall ball. The worst thing you can do in a 1-on-1 situation with the opposing player is to just stand on the line and hope for the best. You’ll need to learn how to effectively cover angles by running toward your opponent and “making yourself big.” This will make it much harder for your opponent to get the ball past you. Skillful players will bait you to make the first move in order to get past you easier. Instead, you should wait for their first move, dive quickly, and just grip the ball. Make sure not to lie down too soon, though, since you have to time it perfectly in order for it to work. Excluding the masters of the game, most of your opponents will usually look to where they’re about to shoot. You can use this against them and make your goalkeeping job depend much less on your reflexes if you learn how to read players’ intentions. If the opposing players are too good to read, you can always read their body language. Look at their supporting foot, for example, since it’ll always face the shooting direction. If you’re really serious about this, you can always watch some videos of your opponents and learn their signature moves and habits, as well as their preferred ways of handling certain situations. This is what professional goalkeepers do before every game, trying to learn how to stop the deadliest players 1-on-1.